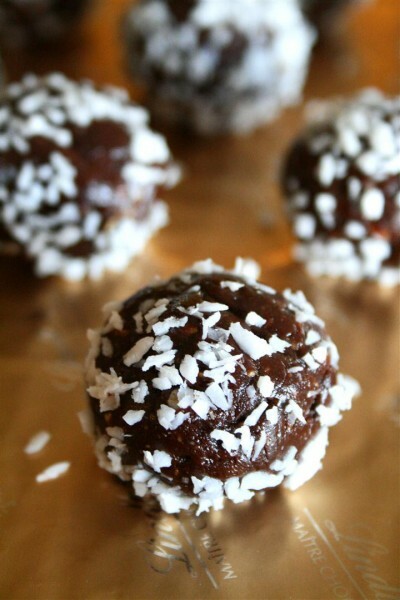 Must-Have Chocolate Snack Balls was posted on June 7th, 2011 and is filed under Desserts, Gluten Free, Kid Friendly, Recipes, Snacks, Vegan. This entry has 21 comments. You can follow any responses through the RSS 2.0 Comment Feed. Do you ever have a moment where you suddenly, with a strong sense of urgency, realize that you need chocolate…like NOW? The feeling doesn’t crawl upon you slowly; it’s like a zero to sixty emotional response. I know. It’s intense, right? This is much too common in my life, but I don’t mind. Chocolate and I never need a reason to be together. (I hear you…you’re thinking I need therapy – that’s okay. I think so too, which is why I eat chocolate. It really is therapy.) I should move on to the point, before you press the x in the corner of your screen. Introducing Chocolate Snack Balls for instant chocolate happiness! Please, when I need chocolate like…now…don’t give me a recipe which has you freeze a fudge for 30 minutes or bake it for an hour (plus oven heating time!!!). No, no, no. It must be now or never. Those recipes are for when I feel grown up and patient. This is my sister Anne-Marie’s recipe, who loves chocolate just as much as I do. This makes a dozen largish balls. Mix. Nibble on the dough. Mix a little more. Eat more dough. Roll into balls. Coat in coconut or chopped nuts (but if you’re in MUST-HAVE mode, skip this step!) for pretty-ness sake. There, all finished. They’re really good cold from the freezer too. I’m actually eating one right now. Because it’s the right thing to do. In other news…today I’m planning on doing my first run since my marathon. And then I saw this little questionnaire on Carrots N’ Cake and thought it would be fun to fill out! Feel free to fill these questions out in the comment section…I love getting to know my readers! Favourite treadmill? The big, strong ones that don’t shake like there’s an earthquake coming. Favourite shoes? My blue Lunarglide Nike+ shoes. Favourite running song? It changes all the time. Usually some sort of Christian worship song. Favourite running fuel? Mandarin Orange GU – my newest favourite. Favourite running accessory? My i-pod and my blue headband. Favourite race distance? Half marathon. It’s challenging, fun, and feels doable. Favourite running memory? When I crossed the finish line doing my first marathon, just eight days ago. I’ll never forget that feeling! Yum! They look so good and so EASY! We are making these! My boys love all these ingredients…anything with chocolate and peanut butter is always a hit. Favorite running memory–running ‘Race for the Cure’ with my 9 year old. It was his first race and we crossed the finish line together! Favorite shoes–Saucony all the way! I just want to grab one right now and bite into it!!! looks so great . Yes – I have that thought often! Unfortunately it cost me like $80 at Whole Foods the other day when I stocked up on Sharffen Berger and Valhrona chocolate…. These sounds crazy good! What a nice healthy homemade snack – just one would satisfy any sweet tooth! 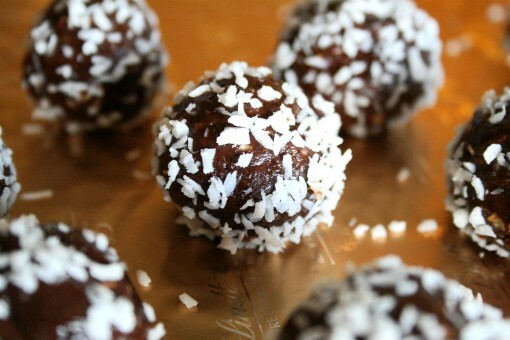 Thanks so much for your comment on my blog :-) I have to say these chocolate snack balls look absolutely amazing! I used to be a runner, but only run occasionally now due to too many injuries, but I love my newish incline Nordic Trac ( 40 % incline gives you a great workout! ), and love “A Beautiful Day” by U2 to work out to! Yes, please! In fact, I would love one right now. Those look delicious. Like they would go all fudgey if refrigerated for a while. I’m sorry that all is not well with your niece. But I am glad they have pin pointed the problem…now you can face the enemy well armed. Favourite treadmill? The outdoor road moving under my feet! Favourite shoes? My old Nikes…I have no idea what they are. Favourite running fuel? Banana + Water + Cocoa Powder Smoothie! Favourite running memory? Running through the Kirstenbosch botanical gardens in Cape Town at sunset! Congrats on the marathon finish…I am, as ever, in awe of people who can commit to training for long distances! Thoughts and prayers for your niece. I love your recipe and I think I need chocolate NOW! Congrats on being in the Top 9! I am glad to find someone who shares the chocolate trouble like me :). Going to make these puppies tonight and will be gone tonight only BTW. Yummy chocolucsious. These are definitely on my must try list….quick, easy and so good. I was intrigued when I read this post. Decided to make them tonight. They are really satisfying. I didn’t feel like going to the store so I chose to make a few changes. I used agave in place of the honey. I have made peanut butter fudge with powdered milk before, so I used that instead of oatmeal. My husband finished off the chocolate chips so I had to do without those…and these delightful little treats were STILL fabulous! Ready in 10 minutes and since they’re rich, you only eat a few. I say that makes them diet food! I’ll try rolling them in mini chips next time. These look so tasty and you make them sound so easy. I’m excited to give them a try! Favourite treadmill? I prefer running outside. Favourite running song? Anything with a good beat – often a good 80’s song will get me moving. Favourite running memory? The sense of accomplishment as I was nearing the end of my 10 miler. I wish you could bottle that feeling! Now these are my kind of snack! Although they are fattening they have plenty of nutrition. Chocolate is full of antioxidants, nut butter has plenty of protein, oatmeal is a great source of fiber and manganese, and maple syrup has trace minerals like potassium and calcium. I’ll be eating these guilt-free before I hit the gym. Congrats on creating a great recipe and making Top 9 on Foodbuzz. Thanks for the congrats on Top 9 peeps! Ya’ll are awesome…so fun to hear what you all love with your running accessories. Kimberly~ Your additions/changes to the recipe sound great! Michelle~ Hear! Hear! What a great idea…chocolate before gym time. I’m sold. What a great recipe! I agree with you; when I want chocolate, I want it at that moment! First time visiting your blog – I really like it! Book marking! I am in “M U S T – H A V E – N O W” mode! I did a net search for something I could throw together quickly with items I already have on hand. Your blog come up – talk about kismet. TY! I’ll be back…to this great spot.